The 3-Ds are so happy that summer is official. To celebrate (you guessed it!) they have each broken out one of their best summer hats. There is darling Domino in her baby blues. Her hat is a light blue and white wide-brimmed fascinator adorned with white flowers and petals. She is wearing a bluebell necklace on a silver chain and a white and pale blue sparkly bracelet. She is carrying one of her fafurite purses -- why it's 'Hello Kitty' (her prefurred designer)! She may have the blues but she's sure not singing them. Especially when there are bountiful butterflies all around. Dylan's quite the colourful character today in his white, orange and purple plaid flatcap with bowtie and watch in coordinating tones. The orange and purple butterflies seem attracted by his hat. Purrhaps they think it will provide them with some CATmouflage! 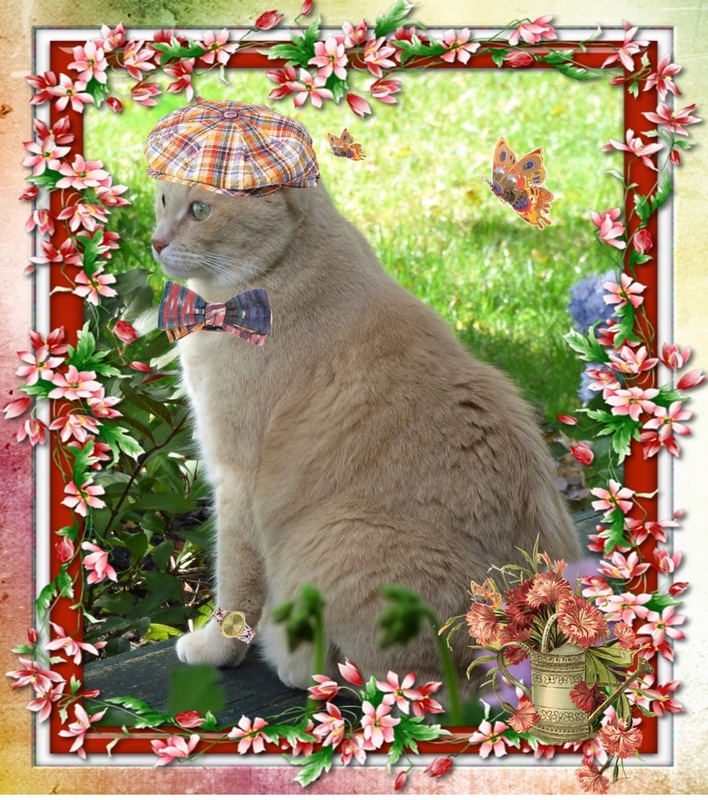 But Dylan isn't the only flower in this garden so the butterflies have several options to choose from. Dante's in his element at the garden's edge. His blue straw fedora keeps the sun off his head and helps to keep it cool. 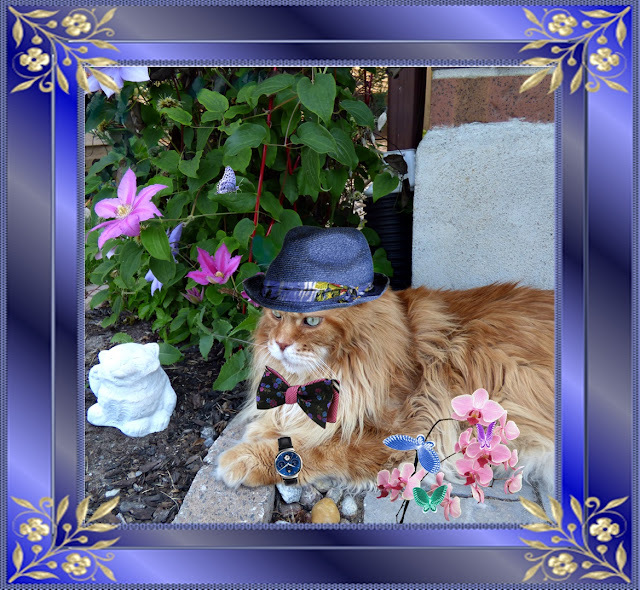 His bowtie of navy and light red with blue and purrple flowers seems very fitting for this locale. He is also sporting a multi-function watch with blue moonface and black band. So wot do I do? I sing to dem, too! Y'all really do look seriously purrfect for any season! Everyone looks amazing. That is a wonderful poem too. WORDLESS WEDNESDAY: DOMINO'S 'MINNIE' ME! DANTE & DYLAN: PURROWLER AT LARGE! DOMINO FACES UP TO IT! 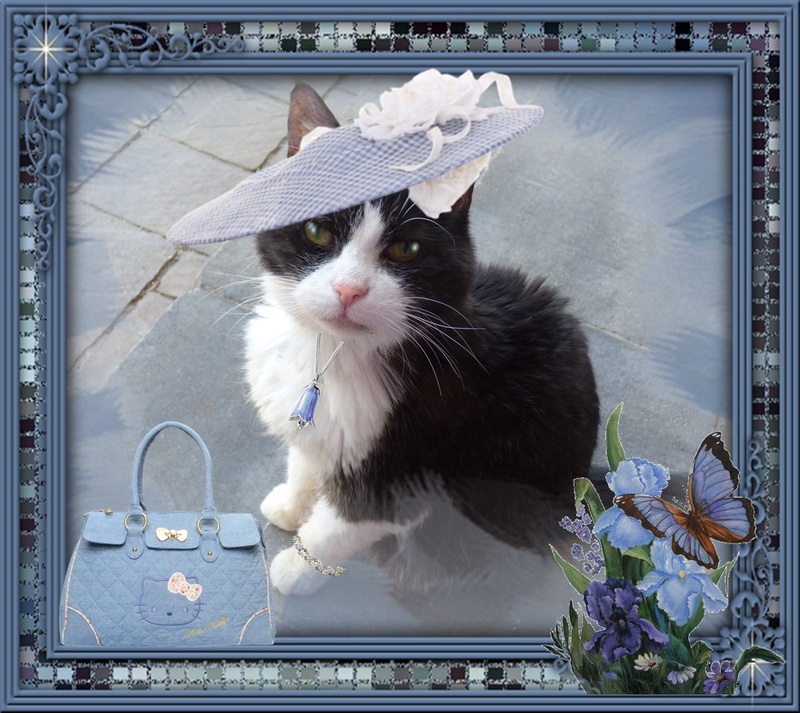 WORDLESS WEDNESDAY WITH DOMINO: FLOWER GIRL!